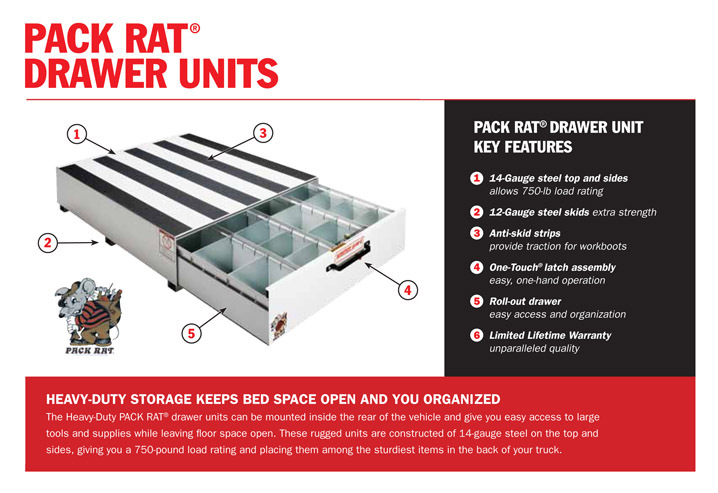 The Model 308-3 bright white steel Pack Rat Standard Drawer Unit has 4 compartments with 24 dividers and has a roll-out drawer load rating of 425 lbs. evenly distributed. The steel top and sides has a load rating of 750 lbs. evenly distributed. This unit can be mounted inside the rear of the vehicle to provide easy access to large tools and supplies while leaving floor space open. Dimensions: H: 9 1/2" W: 39-3/4" L: 48"
Each Drawer Compartment: H: 5" W: 9-3/4" L: 45"